It’s the weekend, you want to get some exercise in AND spend time with your family, hang with friends, indulge a little, and have a good time – whatever that means to you. Life is a balancing act, or to quote one of my friends – a vicious cycle of detox and retox! Compared to many, a food writer’s life is disproportionately weighted heavier on the food and drink side of the pie, which makes the exercise slice even more important. There are people that view food solely as a source of fuel – I’ve never been one of those people. After a particularly grueling, mat Pilates workout I created this smoothie to make me feel like it was all worthwhile. For the past four years most of my waking hours have revolved around food: planning, creating, cooking, eating, and writing about it, and recently I had to face the fact that I have gained 10 pounds sometime since moving to the beach two years ago. How is that possible?! I even feel like I walk more now that the sun, sand, and surf are nearly at my doorstep. Covering restaurants doesn’t help, even though I’m selective and try to keep it to one event a week, the fact is that as you get older, your metabolism slows down. Sheesh, enough of that already. 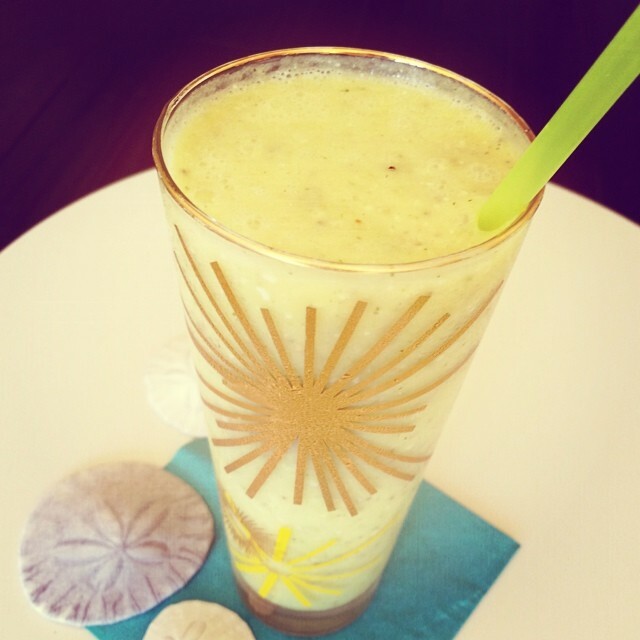 Let’s get to this Pina Colada smoothie. I am well aware, and hope that you are too, that fruit smoothies are high in sugar, even if the fruit is fresh, organic, and full of nutrition, it is sugar – albeit nature’s sugar. A gram of sugar contains almost 4 calories (3.87 to be exact) and that adds up quickly. When College Girl was in high school, all the kids would head immediately to Jamba Juice or Juice It Up for lunch or afternoon pick me-up or to the even more ubiquitous Starbucks for caffeine. My friends did/do the same and, as a mom concerned with nutrition, I felt it was important to educate (not nag) her on the amount of sugar that’s in those smoothes and mocha or pumpkin or whatever sugar-filled concoctions. 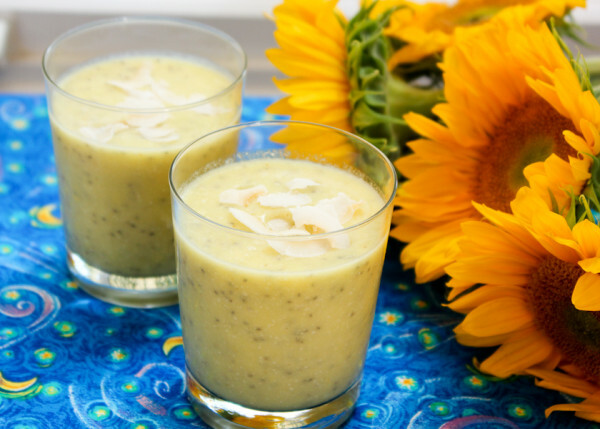 Point being, when making smoothies at home, I try to balance the amount of fruit with a vegetable and protein source – this refreshing Pina Colada smoothie includes zucchini or a yellow carrot, a vegetable that doesn’t alter the color you expect from a Pina Colada. For berry smoothies, I use red chard or beet greens. Spinach, kale, et. al. are great for green smoothies, but it’s good to change up the color. 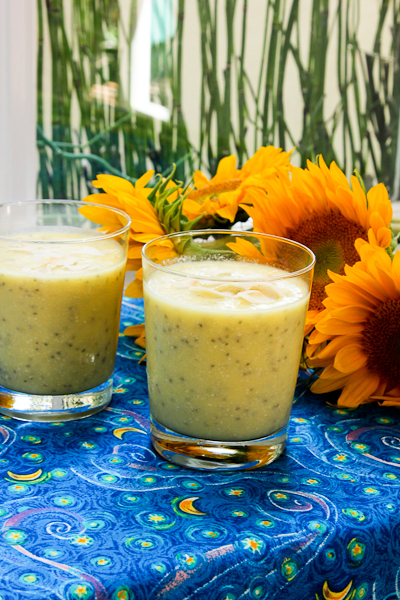 Better than an energy drink, this refreshing, nutritious smoothie replenishes your body, mind, and spirit. 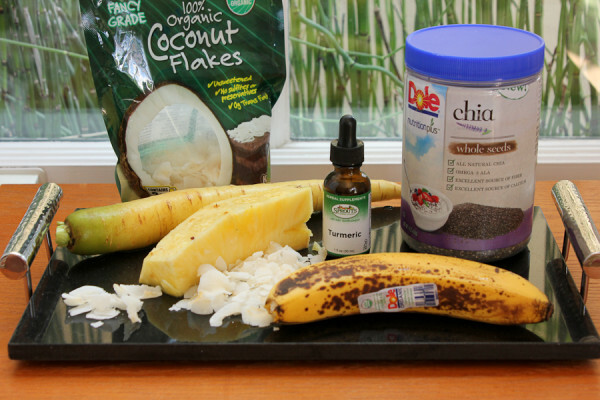 Add all the ingredients to your blender with a few ice cubes on top and blend until smooth. * Turmeric has long been recognized for its healing power by ayurvedic and Chinese medicine practitioners to clear infections and inflammations on the inside and outside of the body, university medical research has Western medicine taking notice of its many healthy benefits as a powerful antioxidant and potent anti-inflammatory. Calories 317/serving; Fat 17 g - Saturated12 g, Trans 0); Carbs 43 g; Fiber 9 g; Sugars 26 g; Protein 5 g; Cholesterol 0; Sodium 91 mg.